Have you ever gotten one of those quizzes where they asked you a series of questions to determine your survivability if you were ever a character in a horror flick? Yesterday, I got home after a talk at OLGC around 10 pm. I parked my car up the driveway by the back door, as usual. The motion light for the back door comes on, and I get out of the car. I hear a male voice coming from the front yard/driveway call out, “Hello.” I turn to look, but because I am in the light and everything is dark — I can’t see a thing. No answer. This is not good. I have an unknown male at an unknown location not too far from me, who is not telling me who he is. Critical error #2: I continue to walk towards the mailbox/person. He says something like “Hello” again. Again, I say that I can’t see them, and ask who it is. No reply. Critical error #4: I keep going! Whoo! No sense of self-preservation in this girl! I am such a good, cooperative little victim, eh? It would probably serve me right if it were the Spawn of Chucky at the end of the driveway waiting for me with a machete. 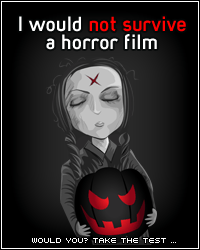 So, I completely flunked my horror flick quiz. When I finally got to the end of the driveway, I didn’t immediately recognize the man, since he normally walks around the block wearing a hat. It was the nice Albanian gentleman who lives sort of across the street from me. He doesn’t really speak English, so he probably didn’t know what I was asking him as I walked up the driveway. He has 3 adult children with families who also have houses on my street. He said “Hi” again when I got up to him. Communication was a little hard, because I don’t speak Albanian, and he doesn’t speak English. After a few hellos, he was still hanging at my driveway, and I didn’t know why he was there. Did he need help with something? I asked how he was doing — if he was good, and he said “Good. Good.” I became worried that I had cut him off or something when I had turned into my driveway when he was out for his walk, and tried to ask him about this, but I don’t think he understood what I was asking, and in any case did not appear to be upset or anything, just pleasant. I asked what he had been doing, or how his day was, or something like that, and he replied, “8 o’clock – work; 4 o’clock – work; 8 o’clock – work; 10 o’clock,” and he shrugs. I thought that he was talking about something in his day. Then, I came to realize that he was making a comment about how I am never home. He must have seen that I was confused or concerned or something, because then he was giving me a big bear hug and saying, “I sorry. I sorry.” Then, we just kind of smiled and laughed and he gave me another hug, and I grabbed my mail and we went our separate ways.